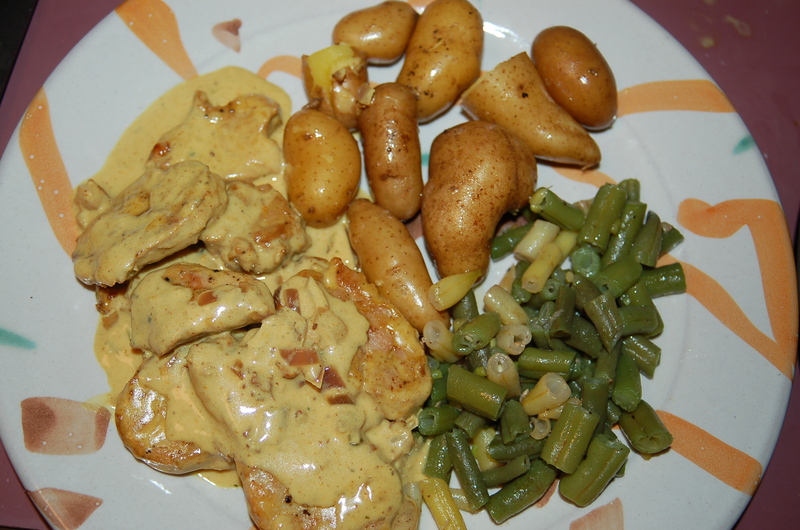 The BEST Curried Pork Tenderloin with Green Beans and Exemplary Boiled Potatoes (serves 6) | Crappy Kitchen - Good Dinners! Let me be crass and exalt, OMG and then tell you that this dinner was inspired by Jane Austen; two very opposite words (the OMG & Ms. Austen, that is) that somehow get flung together in explaining how this dinner came about. It was outstanding. I will admit right now (despite alienating some people and endearing others) that I love Jane Austen’s books, and consequently the movies. I have my favorites, but could happily watch any one of them every night of the week for the rest of my life. I love how people communicated to each other on the simplest matters. One of the lines from Pride and Prejudice has been quoted a lot lately by son in order to tease me, and, to poke at the stuffiness of conversations from that time period. Wow – what accolades to bestow on such a humble tuber, but honestly, I could listen to my food being praised like that all night long. I had a lovely couple of pounds of yellow baby fingerling potatoes from my local farm source and wanted so badly to exemplify them! The best way to cook potatoes that are this fresh and good is to simply boil them and toss in butter and salt. 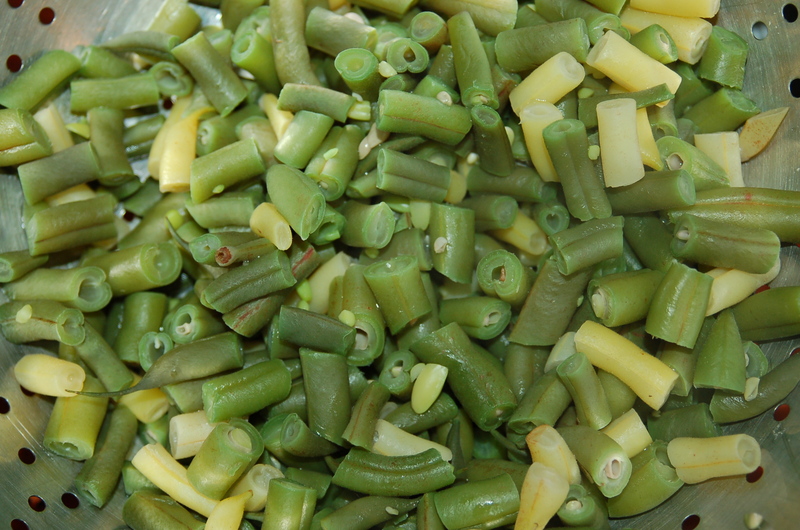 I had green beans and onions from the same place and decided to go with them and make the meal as local as possible. I had pork tenderloin, and instead of roasting it with the usual rosemary and a little broth, I sliced it, fried it in butter and oil, and made an unctuously dreamy curry sauce. I think Mr. Collins would have had a lot to say last night! 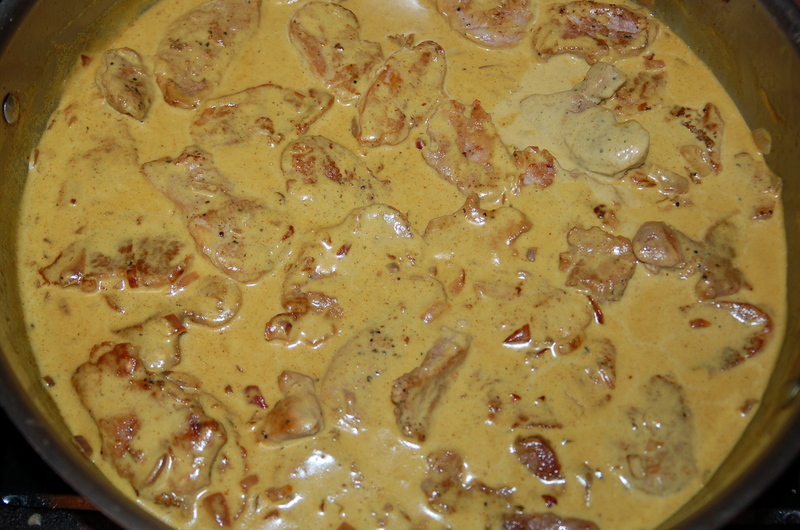 You will need: 2 1 lb pork tenderloin, sliced into 1/3″ pieces, 3 tbs unsalted butter, 3 tbs extra-virgin olive oil, 1 medium red onion, small dice, 1 cup chicken broth, 1 cup heavy whipping cream, 1 tsp strong curry powder,( I used a vindaloo, if your powder is mild, double the amount stated), 1/2 tsp sea-salt, several grinds black pepper, 2 lbs baby fingerling potatoes (or very small white or red potatoes will do also), 1 lb green beans (or green & yellow), cut into 1/2″ pieces. More salt, pepper, butter & oil as needed. 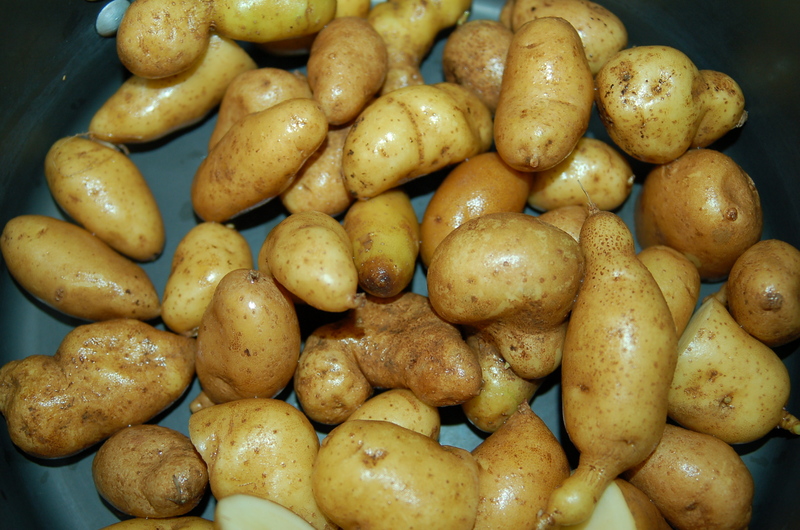 1 – Scrub potatoes and put in pot and cover with cold water. Bring to a boil and simmer with lid on until potatoes are soft all the way through. Drain into colander and then return back to pot. Add a tbs of butter, 1/2 tsp salt and several grinds of pepper and mix in gently. Cover with a tea towel to keep warm until serving. 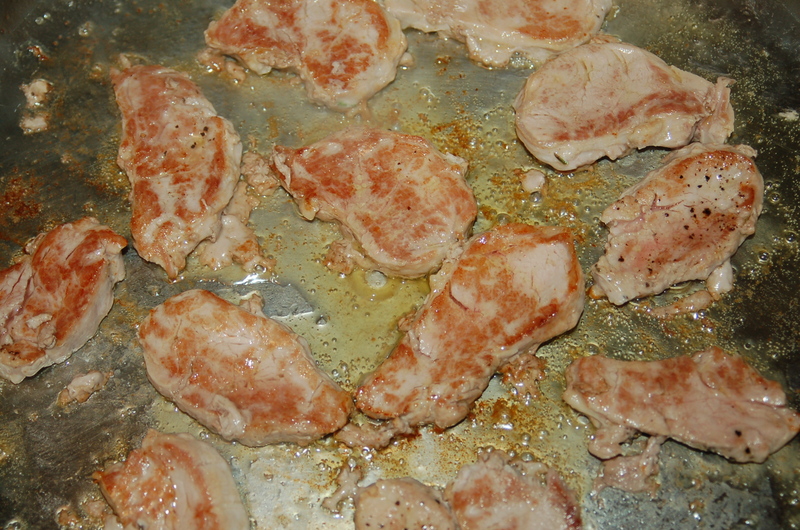 2 – Slice pork and season with salt and pepper. Put big saute pan on med/high heat and working in batches cook pork on both sides adding 1 tbs of oil and 1 tbs of butter as needed. Cook until pork is done (about 6 or so minutes). Transfer to a plate as you go, and cover. 3 – While pork is cooking boil water for the beans. 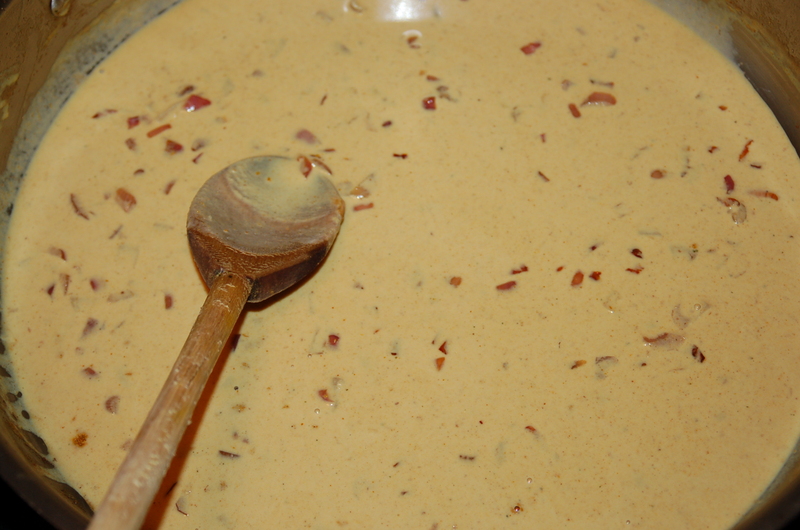 When it comes to a boil, add the beans and cook (covered) until they are soft and cooked completely through. Drain, return to their pot and add a little salt, pepper and extra-virgin olive oil. 4 – When the pork is done, turn down heat to medium/low and add the diced onions (you may need to add a little more oil and butter). Cook for 10 minutes, stirring frequently. 5 – Add the curry powder to the onions and stir for about 30 seconds. Add the flour and stir for another minute. Add the cup of broth and stir until everything is smooth and flour is completely distributed. Add the cream and bring to a simmer. The sauce will thicken. Cook for about 5 minutes. 6 – Add pork to the pan and after about a minute turn off heat. Taste for further seasoning, and add more liquid if you like a thinner sauce. Serve a portion of everything on warm plates. What an Amazing Monday Night Dinner! 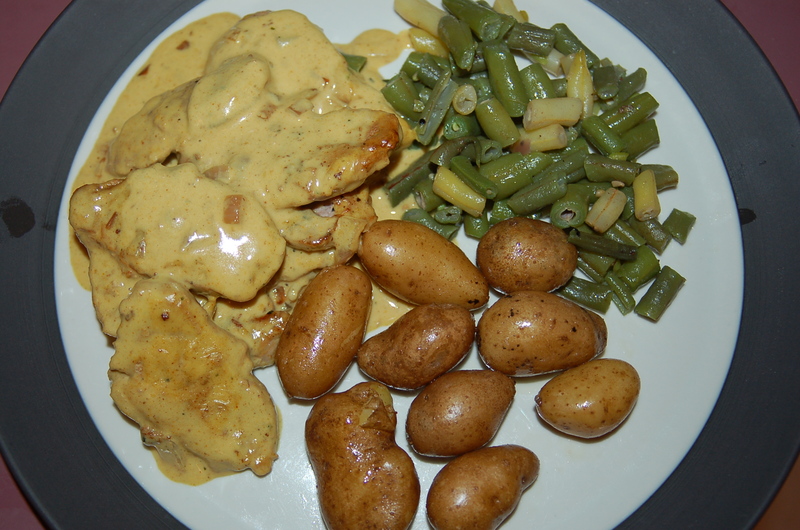 This entry was posted in dinners and tagged curry sauce, fingerling potatoes, green beans, jane austin, pork tenderloin, potatoes, pride and prejudice, red onions. Bookmark the permalink. oops! What an idiot I am. I must have been dreaming of how Jane would have enjoyed a jaunt in a Herbert Austin car lol!